Before writing something on Disney Movies we must pay tribute to one and only Mr Walt Disney the one who created the Great Disney World! Mr Walt Disney was born in 1901 and died in 1966. He is the creator of characters like Micky Mouse and Donald Dock these characters are ever living and will not let his creator die. Many Hollywood Movies were made on the characters made by Mr Walt Disney, few are rated here as top 10 as per some statistical analysis. Pirates of the Caribbean is produced by Jerry Bruckheimer using Disney Movies Characters. 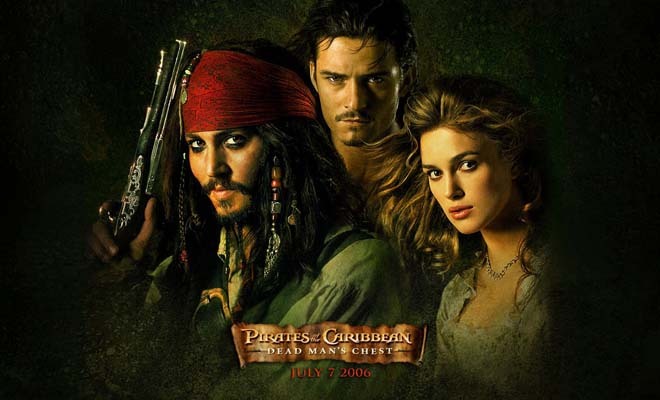 The series based on adventures of Johnny Depp staring as Captain Jack Sparrow along with Geoffrey Rush, Kevin McNally, Orlando Bloom and Keira Knightley(staring as Elizabeth Swann). The series start with ‘The Curse of the Black Pearl’ which was a box office hit of 2003. This movie hit the business of 654 million dollars worldwide. Second part was ‘Dead Man Chest’ was released after three year of first release. One the premiere this part broke all financial records of this year by earning $1,066,179,725. The third part was released in 2007 with subtitle ‘at the world’s end’. The fourth part was released in May 2011 with subtitle ‘On Stranger Tides’ which become second franchise and done one billion dollar business. This film was the eighth film in history which achieves 3.72 billion dollar business so far. ‘Pirates of the Caribbean’ is eight highest grossing film series of the world. Great news for the lovers of ‘Pirates of the Caribbean’ as its fifth part ‘Dead Men Tell No Tales’ is under making and will be complete soon. This part of film is going to release in July 2017.